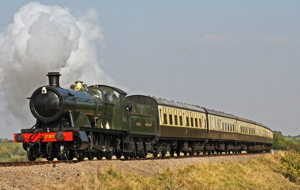 Throughout 2019 the Gloucestershire Warwickshire Railway's famous Fish and Chip Special Train, "The Cheltenham Fryer" will be offering a leisurely Friday or Saturday evening ride through the Cotswold countryside. These steam specials include a large fish and chip meal served in the modern equivalent of the traditional chip shop newspaper - a heat retentive box. Your meal will be delivered to your reserved seats by our train stewards who will also be pleased to serve you refreshments from the Buffet Car including ales and house wines as well as hot and cold non-alcoholic drinks. We respectfully ask that you do not bring with you your own refreshments - there is plenty on the train at very reasonable prices. All Fish and Chip Specials start at Toddington station and travel southwards to Cheltenham Race Course before returning to Toddington. They do not call at Broadway station. These trips sell out very quickly - check for availability of seats by clicking on the 'Book tickets now' button below. The price including train travel in your reserved seat and a large portion of fish and chips is £24 for all the above dates. Please note that there are no children's prices and we don't recommend young children are invited. There is a £1 postage charge per complete booking. Book now by clicking on the big button below. Following sell-out successes every year, we invite you once again to join us for our special midsummer and autumn murder mystery trips. 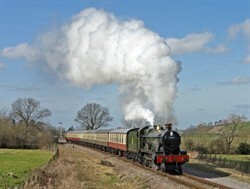 The steam train will leave Toddington Station(satnav GL54 5DT) at 6.30pm and return about 9.30pm. An exciting mystery will be played out around you as you tuck into your fish and chips. Be prepared for the unusual - anything can happen especially when the train is in the tunnel! The price for this evening entertainment is £30.00. Please note that there are no children's prices for this event and we don't recommend young children are invited. There is a £1 postage charge per complete booking. On 16th November we invite you to join us for fish and chips at lunchtime. Your seat will be reserved on the steam train departing from Toddington Station (satnav GL54 5DT) at 1.00pm and the fish and chips will served when we reach Winchcombe station at about 1.15pm. The train returns to Toddington from Cheltenham at about 2.45pm. The price including train travel in your reserved seat and of course a large portion of fish and chips is £24.00. There is a £1 postage charge per complete booking. Children under 5 may travel free but will not be allocated a seat nor, of course, any fish and chips. Seats on all of our fish and chip trains must be booked in advance. The last date for booking is the Wednesday before the train departs. However, please be aware that the trains are often full several weeks before departure. Please note that there are no concessionary rates for these trains. We allocate all seating in advance on these trains so if you want to be seated with other passengers who have booked separately please let us know by email at fishandchips@gwsr.com. If you are unable to book online please telephone the railway at 01242 621405 before sending a cheque so that we may reserve your seats. You may also pay by card on the telephone. Passengers are asked not to bring their own refreshments onto these special trains. Dogs are not allowed on these trains. These trains are run as fish and chip specials and we are unable to offer alternative food as a matter of routine. However, we can cater for those who cannot eat fish and indicate this at the time of booking. In these circumstances we can arrange for a sausage and chips or veggie burger to be supplied in place of fish. We cannot offer any other alternative meal. 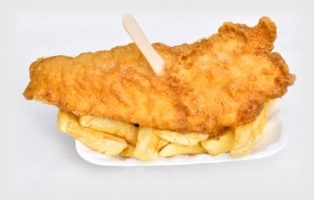 Those with a gluten intolerance may request batter free fish or we can supply a chips only meal. In this circumstance only by arrangement in advance will we allow them to bring their own food with them to have with the chips. Please note that we, like our supplier, are unable to guarantee that any food supplied is 'free from' allergens or specific ingredients such as gluten. We are able to accommodate passengers with mobility dificulties or who are wheelchair users on the fish and chip train but suitable seating is limited. Please contact us by e-mail to fishandchips@gwsr.com to outline your requirements before placing your booking so that we can help you enjoy your visit. 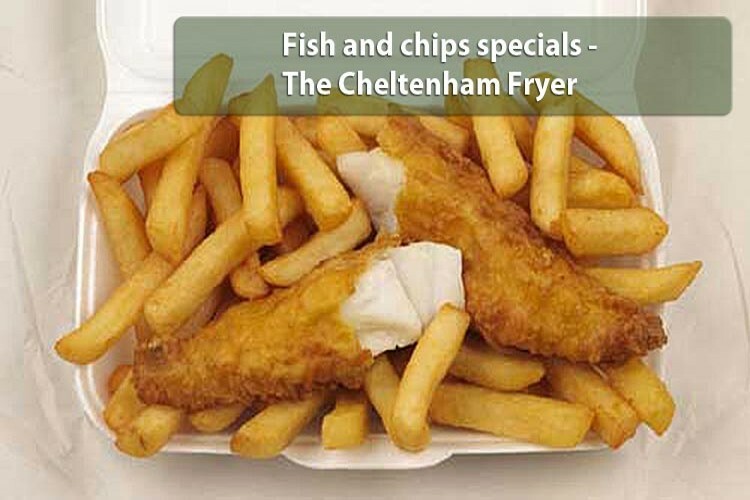 In addition to our Cheltenham Fryer trains, we can also offer a Fish and Chip Charter Train service for parties from 60 to 170 passengers. These make an unusual evening out for your firm, club or perhaps for that special party. Contact the fish and chip organiser via fishandchips@gwsr.com or our administration office to talk about your plans.